"The first phase of the Battle of the Ports"
In a hot fought action amongst the tributaries of the Dyle River our forces brilliantly executed an advance and hold action against elements of the German 8th Panzer Division. They were forced to withdraw in the face of overwhelming odds. The withdrawal was completed in exemplary fashion, with not a single man falling out during the move." Brigadier Stopford deployed his Brigade forward, expecting his French allies to support his left as they had promised to do under the Weygand Plan. However he was not confident of the outcome. The 8th Panzer Division focussed it's initial attack against the Brigade's left flank. 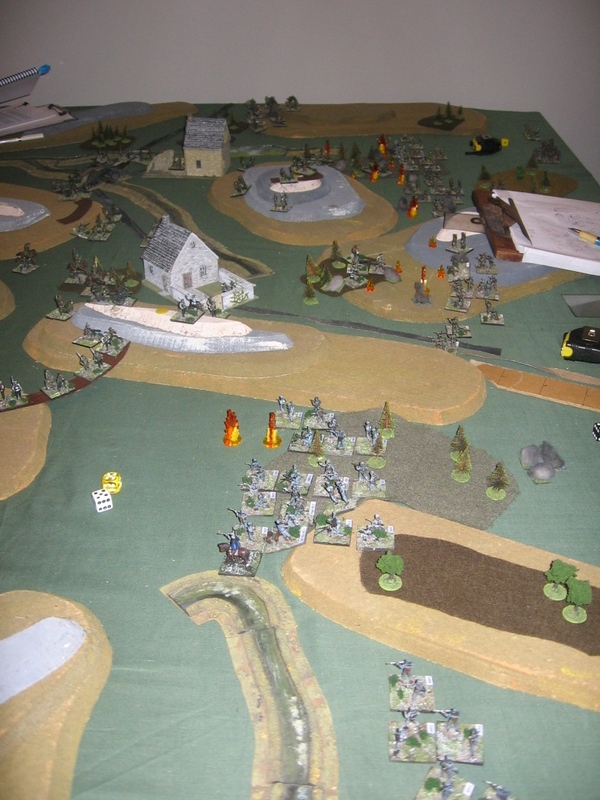 The attacking Schutzen Battalion can be seen top centre, with an attacking tank battalion top left. Stopford had tasked one troop of the Fife and Forfar with a delaying action in the farm that stood directly in the way o the likely German advance. The other troop was deployed in support of his right wing battalion. The advancing Schutzen battalion advances directly towards the outlying troop of the Fifes. The forward line of the left battalion awaits the inevitable assault. The 3 Battalion commander orders two platoons forward, supported by one of his attached Vickers platoons. The attack on the forward position must be stopped. Meanwhile the left flank watches as a complete Panzer battalion advances towards its position. The 4.5:" Howitzer battalion had been tasked with counter battery duty, and succeeded in locating one of the German 105mm battalions, but failed to inflict any casualties on the German artillery throughout the battle. The British 25pdr attacks are achieving nothing, while a fire mission from an attached battalion of German 105mm guns has effectively shot the defending British platoons off the forward objective. The left flank guard holding the river line comes under assault from an entire panzer battalion. The pressure has been too much for the British left wing battalion, and the battalion commander is forced to withdraw his remaining troops. At this stage the German commander commits his reserve tank battalion on the left as a follow up force to his initial attack. 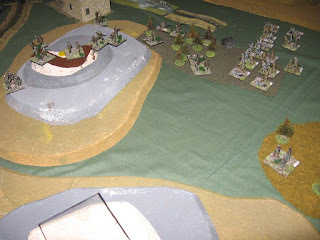 Stopford has realised that his French allies have failed to hold his left flank, and with the forced withdrawal of his own left flank battalion he realises that he must withdraw the brigade or risk losing his entire command. The position on the Dyle has been compromised. The BEF will pull back in order to fight another day. Not a man left behind!!! In the meantime heavy British armour is reported as moving forward from its debarkation ports in order to support the heroic men of the BEF. As a player I'd remained convinced that Keith would introduce a flank march on my own right, and so two of my three battalions (holding my centre and right wing) had remained in place in order to ensure that the key objectives were protected. However this is not the new way of war of the German panzers. 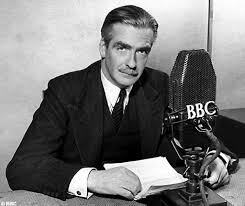 The commitment of the reserve battalion to bypass the remaining defences and so attack rear elements of the BEF meant that my position was no longer tenable. I'd deployed an infantry division defend list, with the infantry supported by the Divisional cavalry, and plenty of artillery. The artillery caused no casualties throughout the entire battle, and inflicted just one neutralisation despite the number of fire missions it undertook. The artillery had been a key part of the defence plan. I'd expected it to provide plenty of suppressions for the troops on the ground to exploit, but these hadn't materialised. The Divisional cavalry were also not deployed to maximise their potential as support elements. Consequently the infantry ended up being left on their own, a situation which is never going to end well with British infantry going 'toe-to-toe' with German infantry. All available arms must be coordinated if a German attacker is to be stopped. Outmanoeuvred and out played.. well done Keith. Feast or famine, it would seem, but such are the demands of the real world. Having had a year that seemed like a 'gaming famine, I am now in a time of plenty, as last night Jon, Stan, Nick and I gathered for our second Great War Spearhead game in a week. Having been reading extensively on the eastern front over the past few weeks, I decided I'd try to set up a game that reflected something of Conrad's attempts to break through the Russian lines in the Carpathian mountains. The terrain was set with a number of three and four contour hills. I decided that the grey and white contours (see the photos) would only be accessible to infantry fighting stands. I also placed a couple of village sectors, and several uncrossable rivers. I wanted to reflect just how rugged the terrain was. The five highest peaks, and the only bridge across one of the river, were all terrain objectives worth two victory points each. The game set up had one and a half Austro-Hungarian divisions attacking an under strength Russian division. The Austro-Hungarians had an artillery advantage, and both sides had limited ammunition availability for their guns. The Austro-Hungarians were also allowed three turns of pre-planned artillery fire from two regiments of 150mm howitzers. All infantry on both sides had random morale. 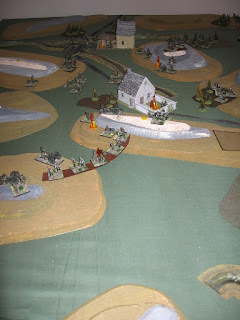 The Russian commander set out his entrenchments, and also placed the HQ stands from any on board defending regiments. The Austro-Hungarian commander then drew his attack arrows, and the precise placement of his pre-planned artillery. Once that was completed the Russian commander was allowed to shift his defending HQs by up to 6", and he set his troops out on the table. This mechanism was drawn from our GWSH variant of Keith McNelly's scenario generation system and added that lovely little bit of 'fog of war' to the game. The game was played using my 20mm armies. The Austro-Hungarian forces are still incomplete so we used early war German infantry as proxies for the Austro-Hungarians. The battlefield in the Carpathians, the Russians defending from the left, the AH forces attacking from the right. The Russian commander was allowed a limited number of Level 1 entrenchments. The Austro-Hungarian pre-planned fire fell across the battlefield. One of the main axes of the Austro-Hungarian attack was evident as pre-planned fire fell around one of the key peaks, and the troops that sheltered in entrenchments. Both pre-planned bombardment casualties came from this position amongst troops clinging to the steep slopes. The main weight of the Austro-Hungarian attack fell on the Russian left and centre. Russian artillery was quick to respond and fire fell amongst the advancing Austro-Hungarian infantry. Action was joined between the Austro-Hungarian infantry and Russian infantry defending a wood. This would be the scene of a prolonged fight. The Austro-Hungarians continue to take fire as they push on. The Austro-Hungarian left wing initially had limited objectives, halting at the edge of another wood, and behind an uncrossable river. Finally the pressure becomes too much and one of the assaulting Austro-Hungarian regiments, a green unit recently arrived at the front, fails its morale check and falls back, leaving a hole on the Austro-Hungarian line. The Austro-Hungarian left now takes action, with one regiment advancing on a timed order to move around the uncrossable river to seize the peak marked with a yellow counter. The other regiment begins to advance its fighting stands out of the wood towards the Russian guns that have been subjecting it to fire. Jon and Stan, the two main commanders... um .. yeah ... what can you say? In the meantime a counter battery fight is going on, and at one stage Russian guns are seriously impaired, but the Russian off board artillery regiment has now exhausted its inadequate stocks of shells. The infantry are on their own. The Austro-Hungarian right wing has pushed on towards the ford and bridge (top centre of the photo). The Russian flank is about to come under extreme pressure. However the Russian commander had kept a small battalion reserve which he now deploys across to his left. He also commits his reserve regiment, knowing that he will need to prop up his front line. The pressure is building. Action is joined between the Russian extreme left and the attacking Austro-Hungarian right wing as the battle for the ford and bridge begins. Pressure on the Russian left holding out in the wood is immense, and casualties are mounting. In the centre the Austro-Hungarian battalion commander pushes his troops forward in a close assault of the Russian defenders in the wood. The results are mixed, and both regiments have reached morale break points. The Russian regiment is Green, the Austro-Hungarian regular, and both pass their morale checks. The survivors of the fierce bayonet assault in the wood in the centre. Meanwhile the Austro-Hungarian left has pushed into the open into a hail of fire. Casualties mount quickly. And now the fight is well underway for the bridge. The action intensifies around the ford and bridge. Those local Russian reserves stream across the bridge into combat to defend the Russian left at the ford. At this stage we ran out of time. The battle was in the balance. The Austro-Hungarians had taken only one of the objectives, the others were still held by the Russians. However Russian artillery stocks were exhausted. Their left was being assaulted by relatively unscathed Austro-Hungarian regiments, but at the same time the deployment of fresh reserves looked set to shore up the Russian line. I was very happy with the outcome. The Austro-Hungarian forces were arguably too weak to take the objectives. Fighting in the rugged terrain had meant that the Russian defenders struggled to create supporting positions. As a consequence the battle tended to take place in isolated pockets. The outcome was definitely in line with the rest of Conrad's Carpathian Capers in 1915, and we had all had an immensely enjoyable evening's 'gaming, to boot.